On May 13, Rep. Seth Grove (R-Dover) spoke at the Alliance of Bikers Aimed Toward Education (ABATE) rally at the State Capitol. 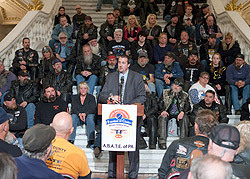 ABATE is advocating for legislation authored by Grove that would limit the number of times an individual may apply for a motorcycle learner’s permit. The legislation is now awaiting a vote by the full House. Grove also authored Act 84 of 2012, which requires minors who hold motorcycle permits to successfully complete the free 15-hour Basic Rider Course. HARRISBURG – The House Transportation Committee today unanimously approved Rep. Seth Grove’s (R-Dover) legislation that would limit the number of times an individual could apply for a motorcycle learner’s permit to three times in a five-year period and would prohibit the renewal of motorcycle learner’s permits. Grove noted the month of May is significant to this legislation because it is Motorcycle Safety Awareness Month. He participated today in the Alliance of Bikers Aimed Toward Education (ABATE) rally at the State Capitol. Video of Grove participating in the ABATE rally is available at http://www.youtube.com/watch?v=SGp4tnexLSk. Last year, Grove won passage of legislation to require minors who hold motorcycle permits to successfully complete the free 15-hour Basic Rider Course through the Pennsylvania Motorcycle Safety Program. The bill was signed into law as Act 84 of 2012. House Bill 892, which is supported by ABATE, was drafted with the help of law enforcement. It will now go before the full House for consideration.